Sunday Pets Tasty Holistic Grain Free Adult ; Tasty Holistic Protein Rich, Low Carbo, Low Fat, Courtesy of Tasty Holistic. Dogs are not born to eat the same type of diets as humans. Grain Free, Rich in Protein & Low in Carbohydrates is said to more closely mimic their natural diet, meeting the nutritional demands for overall wellness. No odds and ends, with artisanal effort , Our food is made with nothing but the best quality ingredients - with nothing unnecessary added and nothing important taken away. All our food is made with sustainable, tasty and natural ingredients to suit your pet's nutritional needs. We care about what your pet eats, so our 'Small Batch, Gentle Baked' guarantees that our food is safe, pure and nutritious. 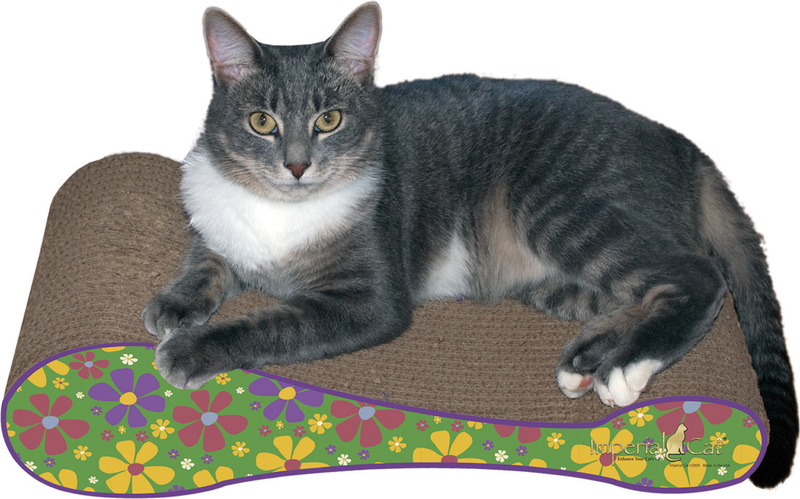 AT SUNDAY PETS™, our artisan baker puts in more thought, creativity and effort to produce each and every product. 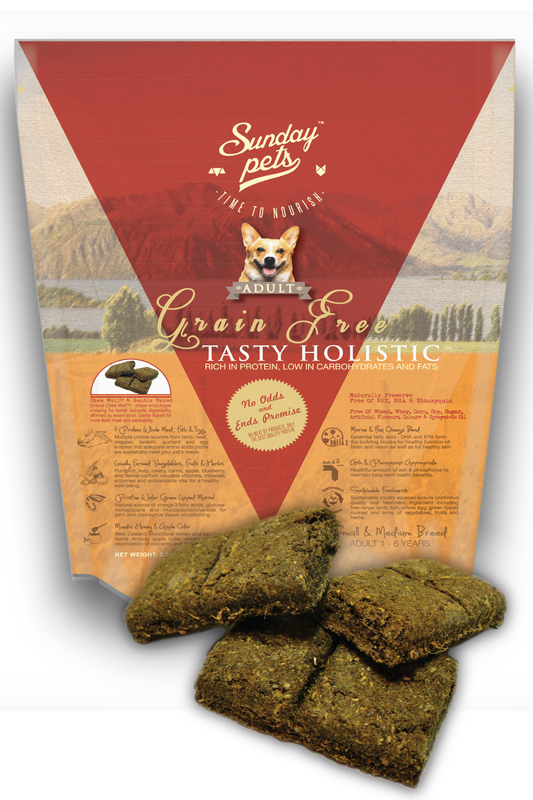 All Sunday Pets ingredients are sustainable locally sourced in New Zealand to ensure continuous quality and freshness! Our Ingredients/ Composition: Meat (min 79%Free Range Lamb , Lamb Meal, Beef Meal, Snapper meal, Tarakihi meal, Gurnard meal), Egg (min 1%), Vegetables (min10% Potato, Carrot, Pumpkin, Celery, Kelp and other seasonal vegetables) Fruits (min 3.5% Apple, Blue Berry and other seasonal fruits) Apple Cider Vinegar (min 0.6%), Manuka Honey (min 0.6%), Green lip mussel (min 0.3%), Flaxseed (min 0.1%), Fennel (min 0.06%), Naturally preserved with mixed tocopherols. Nutritional Additives: Vitamins- Vitamin A 15 kIU/kg, Vitamin D3 2 kIU/kg, Vitamin E 400 IU/kg, Vitamin B1 0.9 mg/kg, Vitamin B12 0.5 mg/kg, Thiamine (Vitamin B1) 50mg/kg. Riboflavin (Vitamin B2) 45 mg/kg, Niacin 450 mg/kg, Pantothenic Acid (Vitamin B5) 50 mg/kg, Pyridoxine (Vitamin B6) 38 mg/kg, Biotin 1 mg/kg, Folic Acid 5.2 mg/kg, Choline 2700 mg/kg Ascorbic Acid 55 mg/kg. Minerals- Magnesium 0.1%, Manganese 27 mg/kg, Cobalt 0.47 mg/kg, Selenium 0.9 mg/kg, Iron 240 mg/kg, Zinc 200 mg/kg, Copper 26 mg/kg, Iodine 1.8 mg/kg. Sunday Pets Tasty Holistic™ is naturally preserved. Grain Free, Rich in Protein and Low in Carbohydrates: In the wild your dog’s diet would consist of primarily meat based proteins, and the occasional fruit and vegetable. Grain was consumed very little. Grain has in fact been found to cause or irritate some pets’ allergies. Grain is also very hard to digest especially in young and aged companions. Though dogs are not “pure carnivores” like feline, they still consume a mostly protein-dominated diet in the wild given by nature. Dogs in the wild do not consume a large amount of carbohydrates. Grain free, rich in protein & low in carbohydrates is said to more closely mimic this natural diet, providing essential nutrients for a healthy lifestyle. 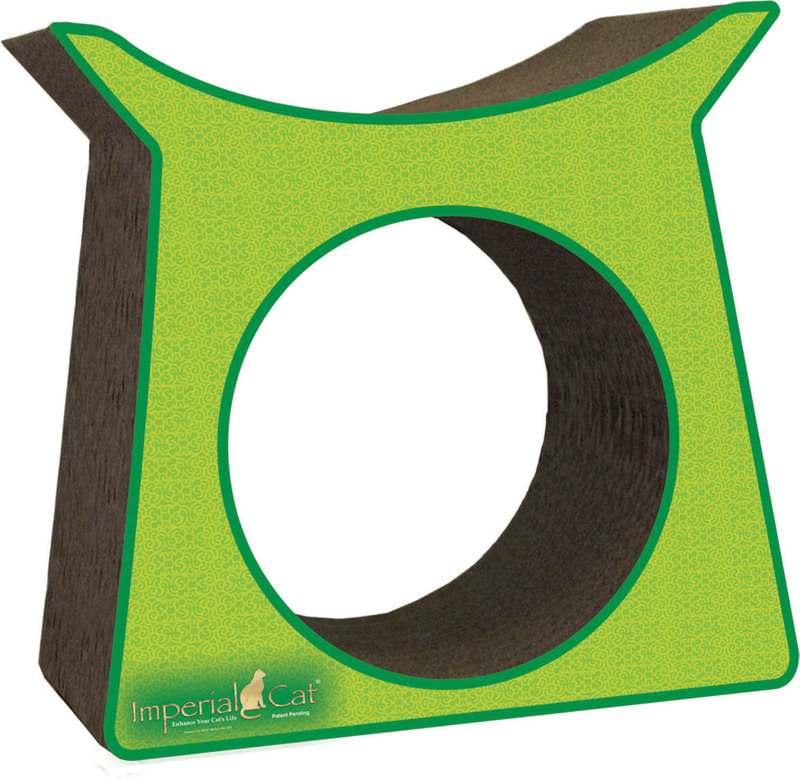 Chew Well ™, Gentle Baked: At Sunday Pets™, our unique Chew Well™ shape combined with Gentle Bake process attain better digestibility and natural palatability. Many companions have trouble eating “normal dry food”, they have an unhealthy habit of eating too fast and they “Swallow” not “Chew”. This swallowing without much chewing can lead to problems like indigestion, stomach ulcer, constipation, vomiting, bloat and coprophagy. Preventing your companion from eating too fast is an important part of properly caring for them yet can be challenging. Chew Well™ unique revolutionary shape was born out of deep thought and research to solve these problems. Chew Well™ encourages companions to eat at a slower rate by chewing each kibble. Gentle baked produces a soft crunchy texture that is not highly “compressed to form extremely hard pellets” or “processed to give a uniform shape”. It can be easily digest and more nutrients absorbed, affirmed by the lesser stool volume. At Sunday Pets, palatability is the taste of nature. More fresh meat can be use in a gentle baked process, and without the addition of flavourings or spraying of preserved fats on the kibbles, normally use in other process methods. 3 proteins Source-Whole Meat, Fish & Egg: Multiple protein sources from lamb, beef, snapper, tarakihi, gurnard and egg ensure that adequate amino acids profile that are available to meet your pet’s needs. Protein is an important component of every cell in the body. Hair and nails are mostly made of protein. Your pets’ body uses protein to build and repair tissues. They also use protein to make enzymes, hormones, and other body chemicals. It is an important building block of bones, muscles, cartilage, skin, and blood. Therefore a adequate amino acids profile from multiple protein source is necessary for optimal health. Fresh Ingredient: We only use 100% grass fed, free-range New Zealand lamb, never placed in feedlots, never given hormones, never given antibiotics. A growing body of research indicates that they had 14% less fat and about 8 % more protein compared to grain-fed lamb, Grass-fed lamb is an excellent source of vitamin B-12, niacin, zinc, a good source of iron. It also contains a higher source of omega-3 fatty acids, Vitamin E and beta-carotene then other meat. Manuka Honey & Apple Cider: Sundays Pets uses premium Manuka honey, a monofloral honey made by bees in New Zealand that frequent the manuka bush. Manuka honey has great anti-microbial and anti-bacterial properties, and excellent energy source with a wide range of benefits. It also contain amylase and invertase which aid digestion. Apple cider vinegar, an old-timers home remedy, rich in potassium and normalizes acid levels in the stomach, improving digestion, improves assimilation of nutrients, reducing intestinal gas and faecal odour. Apple cider vinegar also helps them with arthritic conditions, controls fleas & barn flies, and gives a beautiful shine to their coats! Pristine Water Green Lipped Mussel: We use only New Zealand Green Lipped mussels found in the pristine waters of New Zealand. This mussel is nutritionally packed with a rare combination of proteins, lipids, omega 3 fatty acids, and complex carbohydrates. In their natural state, Green-lipped mussels have a high quantity of natural mucopolysaccharides (commonly referred to as MPS) or Glycosaminoglycans (commonly referred to as GAGs) and chondroitin. MPS and GAGs are groups of carbohydrates that are ‘the glue of life’ presence in joints and connective tissues that hold the structure (pets body) together. With New Zealand green lipped mussel, it is a good overall approach to good joint and connective tissues health, against daily wear and tear for your senior companion. Marine and Flax Omega Blend: Marine and Flax omega blend obtain from marine source like deep sea cold fish, green lip mussel and cold press flaxseed provide abundant essential fatty acid to act as building blocks for proper development and function of brain and retina. DHA and EPA are also excellent elements to keep your skin healthy and supple. They are known to prevent the skin from getting dry and flaky. For the heart to function properly, there should be good blood flow, and the nutrients that promote healthy cardiovascular function are DHA and EPA because they get converted into prostaglandins, which are hormone like substances that help the heart function better. As our pets grow older and their bodies age, their mental processes and cognitive abilities also change and are not as sharp as they are supposed to be. DHA and EPA levels begin to fall and it could slowly lead to age related diseases in which a gradual loss of memory becomes most apparent. To counter this, having DHA and EPA, can help older pets remain sharp and better focused even in their advanced years. Ash and Phosphorus Appropriate: At Sunday Pets™ we ensure that our food of different life stages (many food take note of it only for senior diet) healthful amount of ash & phosphorus to maintain long-term health benefits. Ash is the non-combustible, or non-burning, portion of pet food. High ash levels in pet foods are not only a reflection of how much bone is in the product but also the quality of the pet food. Since the greater part of ash is not absorbed it lowers the digestibility of the food—which means more waste—and adversely affects palatability. Phosphorus, calcium and other minerals make up a large part of ash that means high ash foods usually contain higher levels of phosphorus and calcium. They also have very important roles throughout the body including: blood coagulation, energy metabolism, transmission of nerve impulses, and cell membrane integrity to name a few. Most foods contain two-to-three times the levels of phosphorus and calcium required by dogs and cats, so calcium and phosphorus deficiencies are not seen in pets fed commercial pet food. But, medical problems due to excess phosphorus and calcium do occur. Phosphorus is a large factor in kidney disease. When kidney function begins to decrease—due to trauma, toxins, old age, disease, or other factors—excess phosphorus promotes further kidney damage. More than 70% of kidney function has to be lost before a dog or cat begins to show signs of kidney disease, so high phosphorus diets may be harming a healthy kidney—and you would not know. Locally Farmed Vegetables, Fruits and Herbs: Pumpkin, Broccoli, Carrot, Celery, Kelp, Apple, Blueberry and Fennel contain valuable vitamins, minerals, enzymes and antioxidants vital for a healthy well-being. The main antioxidant are Vitamin A, C and E together with selenium destroy or disable free radicals that our bodies generate, providing the bodies with antioxidant is one of the best forms of preventives health care we can give to our pets. Sustainability Freshness: Sustainable locally sources ensure continuous quality and freshness ingredient including free range lamb, fish, whole egg, green lipped mussel, array of vegetables, fruits and herbs. Sustainability involves farming and fishing methods that are healthy, do not harm the environment, respect workers, are humane to animals, provide fair wages to farmers, and support farming communities. Supporting Sunday Pets helps ensure that there will be fresh produce available – and people to harvest them – for years to come. We consider sustainability the main principle of our business, and as such, our entire inventory is cross-checked against scientific. Our reliance on independent (rather than industry-supported) research helps us to ensure that everything we source comes from abundant populations that are well managed and caught or farmed in an environmentally friendly way. This also ensures great traceability for the meal that is place in you pets bowl.